Tuscan salad – Panzanella: CIAO and welcome to your next Italian salad. 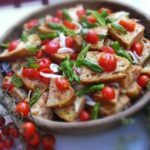 Panzanella is a bread based salad typical around the region of Tuscany and for us at The Big Dream Factory, make perfect use of all those delicious ingredients that you can find at the farmer’s market! 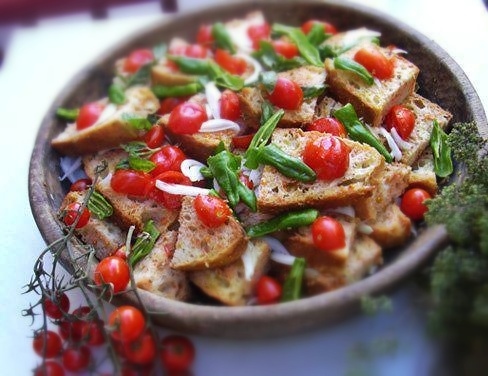 Many recipes you find for Panzanella, call for Tuscan bread. Tuscan bread is typically very dense and is the type of Italian household bread you find all over Italy often used for making bruschetta. So, if you are unable to find ‘Tuscan’ bread, any dense bread will do. However, our Traveling Baker, Ang, of Ferrara’s Bakery, might be able to supply you with some and hers is VERY ITALIAN! 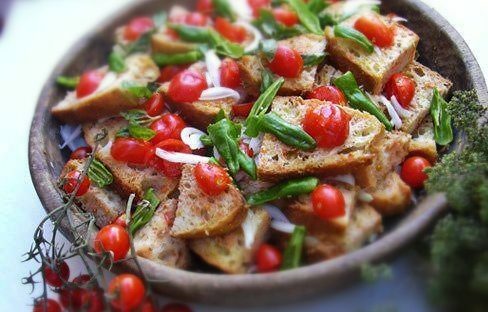 The original ancient recipe of Panzanella was based on bread and onions soaked in oil and vinegar. Over the centuries the recipe has evolved to include cucumbers and tomatoes. However you decide to serve your Panzanella, this is a very ‘unassuming’ salad that promises to deliver wonderful flavours. We hope you give it a try and experience a little dish of Italy in your home. Soak the bread in cold water for a few minutes. 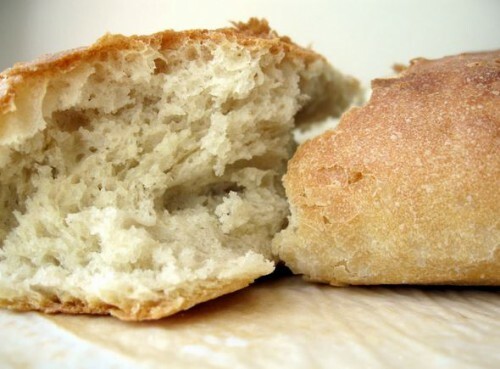 Then squeeze out as much water as you can, crumble, dice or thinly slice the bread into a big bowl. Add all the vegetables and basil leaves and mix well. Add half the olive oil, salt and pepper and mix again. Allow to stand in the fridge for an hour or more. Add the vinegar and remaining extra virgin olive oil and mix again.